The stator is made of three parts: a stator core, conducting wire and frame. A three-phase, four-pole induction motor is made of two main parts: a stator and a rotor. The stator is made of three parts: a stator core, conducting wire, and frame. The stator core is a group of steel rings that are insulated from one another and then laminated together. These rings include slots on their inside that the conducting wire will wrap around to form the stator coils. Simply put, in a three-phase induction motor, there are three different wire types. You can call these wire types Phase 1, Phase 2, and Phase 3. Each wire type is wrapped around the slots on opposite sides of the inside of the stator core. Once the conducting wire is in place within the stator core, the core is placed within the frame. Because of the complexity of the topic, the following is a simplified explanation of how a four-pole, three-phase AC induction motor works in a car. It starts with the battery in the car that is connected to the motor. Electrical energy is supplied to the stator via the car’s battery. The coils within the stator (made from the conducting wire) are arranged on opposite sides of the stator core and act as magnets, in a way. Therefore, when the electrical energy from the car battery is supplied to the motor, the coils create rotating, magnetic fields that pull the conducting rods on the outside of the rotor along behind it. The spinning rotor is what creates the mechanical energy needed to turn the gears of the car, which, in turn, rotate the tires. Now in a typical car, i.e., non-electric, there is both an engine and an alternator. The battery powers the engine, which powers the gears and wheels. The rotation of the wheels is what then powers the alternator in the car and the alternator recharges the battery. This is why you are told to drive your car around for a period after being jumped: the battery needs to be recharged in order to function appropriately. There is no alternator in an electric car. So, how does the battery recharge then? While there is no separate alternator, the motor in an electric car acts as both motor and alternator. Fig. 1. The term alternating current defines a type of electricity characterized by voltage and current that varies with respect to time. This is due to the alternating nature of the AC signal that allows the voltage to be easily stepped up or stepped down to different values.That’s one of the reasons why electric cars are so unique. As referenced above, the battery starts the motor, which supplies energy to the gears, which rotates the tires. This process happens when your foot is on the accelerator — the rotor is pulled along by the rotating magnetic field, requiring more torque. But what happens when you let off of the accelerator? When your foot comes off the accelerator the rotating magnetic field stops and the rotor starts spinning faster (as opposed to being pulled along by the magnetic field). When the rotor spins faster than the rotating magnetic field in the stator, this action recharges the battery, acting as an alternator. The conceptual differences behind these two types of currents should be obvious; while one current (DC) is consistent the other (AC) is more intermittent. However, things are a bit more complicated than just that simple explanation, so let’s break these two terms out in a bit more detail. The continuous current refers to a constant and unidirectional electric flow. Furthermore, the voltage keeps the polarity in time. On batteries, in fact, it is clearly marked which the positive and negative poles is. These use the constant potential difference to generate a current always in the same direction. In addition to batteries, fuel cells and solar ones, also the sliding between specific materials can produce direct current. The term alternating current defines a type of electricity characterized by voltage (think water pressure in a hose) and current (think rate of water flow through the hose) that vary with respect to time (fig. 1). As the voltage and current of an AC signal change, they most often follow the pattern of a sine wave. Due to the waveform being a sine wave, the voltage and current alternate between a positive and negative polarity when viewed over time. The sine wave shape of AC signals is due to the way in which the electricity is generated. Another term you may hear when discussing AC electricity is frequency. The frequency of the signal is the number of complete wave cycles completed during one second of time. Frequency is measured in Hertz (Hz) and in the United States the standard power-line frequency is 60 Hz. This means that the AC signal oscillates at a rate of 60 complete back-forth cycles every second. AC electricity is the best way to transfer useable energy from a generation source (i.e., a dam or windmill) over great distances. Fig. 2. A polyphase system uses multiple voltages to phase-shift apart from each one in order to go intentionally out of line. This is due to the alternating nature of the AC signal that allows the voltage to be easily stepped up or stepped down to different values.This is why your home’s outlets will say 120 volts AC (safer for human consumption) but the voltage of a distribution transformer which supply power to a neighborhood (those cylindrical grey boxes you see on the power line poles), might have voltage as high as 66 kVA (66,000 volts AC). How does a three-phase, four-pole induction motor work? Most large, industrial motors are induction motors and they are used to power diesel trains, dishwashers, fans, and countless other things. 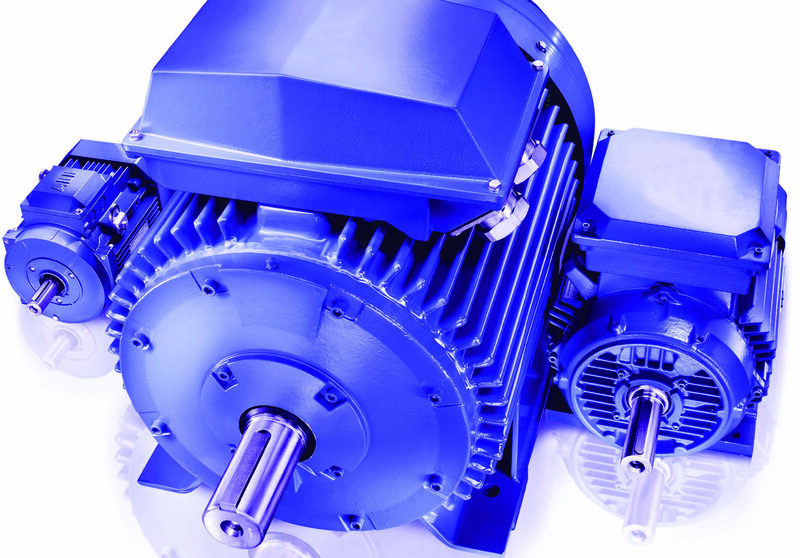 However, what exactly does an “induction” motor mean? In technical terms, it means that the stator windings induce a current to flow into the rotor conductors. In layman’s terms, this means that the motor is started because electricity is induced into the rotor by magnetic currents instead of a direct connection to electricity, like other motors such as a DC commutator motor. What does polyphase mean? Whenever you have a stator that houses multiple, unique windings per motor pole, you are dealing with polyphase (fig. 2). It is most common to expect a polyphase motor to be made up of three phases, but there are motors that utilize two phases. A polyphase system uses multiple voltages to phase-shift apart from each one in order to go intentionally out of line. Fig. 3. Three phase refers to the electrical energy currents that are supplied to the stator via the car’s battery . What does three phase mean? Based around Nikola Tesla’s basic principles defined in his polyphase induction motor put forth in 1883, “three phase” refers to the electrical energy currents that are supplied to the stator via the car’s battery (fig. 3). This energy causes the conducting wire coils to start to behave like electromagnets. A simple way to understand three phase is to consider three cylinders, shaped in a Y formation, utilizing energy pointed toward the center point to generate power. As the energy is created, the current flows into the coil pairs inside the engine in such a way that it naturally creates a north and south pole within the coils, allowing them to act like opposite sides of a magnet. As this technology continues to advance, the performance of electric cars are starting to quickly catch up to, and even outperform, their gas counterparts. While there remains some distance for electric cars to go, the leaps that companies like Tesla and Toyota have made to this point have inspired hope that the future of transportation will no longer be reliant on fossil fuels. At this point, we all know the success that Tesla is experiencing in the field, putting out the Tesla Model S Sedan that is capable of driving up to 288 miles, hitting 155 MPH, and has 687 lb-ft torque. However, there are dozens of other companies that are seeing massive progress in the field, such as Ford’s Fusion Hybrid, Toyota’s Prius and Camry-Hybrid, Mitsubishi’s iMiEV, Ford’s Focus, BMW’s i3, Chevy’s Spark, and Mercedes’ B-Class Electric (fig. 4). Electric engines impact the environment both directly and indirectly at a micro and macro level. It depends on how you want to perceive the situation and how much energy you want. From the individual standpoint, electric cars do not require gasoline to run, which leads to cars with no emissions populating our highways and cities. While this presents a new problem with additional burden of electricity production, it alleviates the strain from millions of cars densely populating cities and suburbs putting toxins into the air (fig. 5). Note: The MPG (miles per gallon) values listed for each region is the combined city/highway fuel economy rating of a gasoline vehicle that would have global warmings equivalent to driving an EV. Regional global warming emissions ratings are based on 2012 power plant data in the EPA’s eGrid 2015 database. Comparisons include gasoline and electricity fuel production emissions. The 58 MPG U.S. average is a sales-weighted average based on where EV’s were sold in 2014. From a large-scale perspective, there are several benefits to the rise of electric cars. Fig. 5. Miles-per-gallon values for each region of the country is the combined city/highway fuel economy rating of a gasoline vehicle that would have global warming’s equivalent to driving an EV. For starters, there is a reduction in noise pollution as the noise emitted from an electric engine is far more subdued than that of a gas-powered engine. In addition, because electric engines do not require the same type of lubricants and maintenance that a gas engine does, the chemicals and oils used at auto-shops will be reduced due to fewer cars needing check-ups. The electric engine is changing the course of history in the same way that the steam powered engine and printing press redefined progress. While the electric engine is not paving new grounds in the same vein as these inventions, it is opening up a brand new segment of the transportation industry that is not only focused on style and performance, but also external impact. So, while the electric engine may not be reforming the world due to an introduction of some brand new invention or the creation of a new marketplace, it is redefining how we as a society define progress. If nothing else is to come from the advancements with the electric engine, at the very least we can say that our society has moved forward with our awareness of our environmental impact. This is the new definition of progress, as defined by the electric engine.